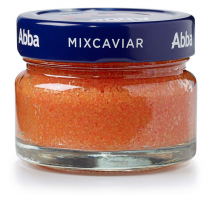 High quality caviar mix from moiva and herring caviar. This mix contains especially large caviar grains. We recommend using caviar as a delicacy, as well as for preparation of sauces and supplementing the taste of dishes. Catch: capelin (Mallotus villosus) roe – ocean and seas near Iceland and Faroe Islands, Norwegian Sea and Barents Sea; herring (Clupea harengus) roe – Norwegian Sea and North Sea. 100 g of product contains: energetic value – 330 kJ (80 kcal); 3.5 g fat (from which 1.2 g saturated fat acids); 2.5 g carbohydrates (from which 1.3 g sugar); 9 g proteins; 5 g salt.